For the first time ever, Customer Registration and My Account functionality has been built into Yahoo Stores. 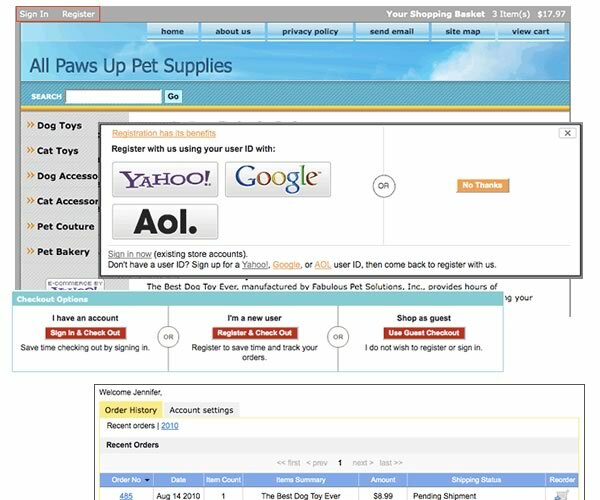 This new technology integrates seamlessly with your custom Yahoo Store. We are offering three different variations on installation into your Yahoo! Store. Customer Registration will be added directly above your sites header. Installation Only: With this option we will code your custom templates to allow for the new Customer Registration and give you the opportunity to enable the registration and customize your colors on your own. Installation & Color Optimization: We will install the Customer Registration on your custom templates and adjust the colors to match the look and feel of your site. Installation, Color Optimization & Custom Buttons: This is the best option for conversions. We will install the Customer Registration, modify the colors to match the look and feel of your site and also design all of the custom buttons necessary to create a perfectly seamless experience for your customers. SPECIAL OFFER: Save 50% on Floating Cart when ordered with My Account Installation! Makes registering for a store account fast and simple. Seamless integration into the Customer Registration options in the back end. Please note, if you do not have custom templates in your store, we will create a new template to install the Customer Registrationt. Stores with the default Yahoo Templates may have to manually switch the default templates to the new template. We will teach you how to do this. It is a very simple process (as easy as changing the price on an item) but it will need to be completed manually per product in your store. Please let us know if you have any questions.